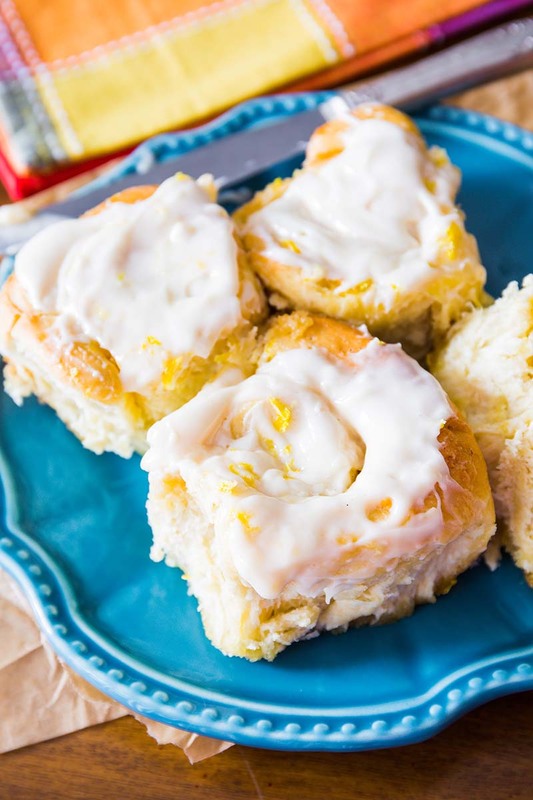 Fluffy & soft lemon sweet rolls covered in a simple lemon cream cheese frosting. These rolls use a quick sweet roll dough – only one rise! Make the dough: Set aside ½ cup of flour. In a large bowl, mix the 2 and ¼ cups flour, sugar, salt, and yeast together until evenly dispersed. Set aside. After the dough has sat for 10 minutes, roll it out into a 14x8-inch rectangle on a lightly floured surface. Spread the softened butter on top. Sprinkle the lemon sugar filling all over. Starting with the longer side, roll up the dough tightly. Cut into 10-11 even pieces and place in a lightly greased 9-inch round pan. Sprinkle uncooked rolls with additional lemon zest at this point, if desired. Loosely cover the rolls with aluminum foil and allow to rise in a warm, draft-free place for 60-90 minutes. After the rolls have doubled in size, preheat the oven to 375°F. Bake for 25-30 minutes until lightly browned. You can cover the rolls with aluminum foil after 15 minutes to avoid heavy browning. *Overnight: The dough may be made the night before through step 5. Cover with plastic wrap and let rise in the refrigerator overnight. The next morning, remove from the refrigerator and let rise, about 1 hour. *If you replace Red Star Platinum with regular active dry yeast, your rise time may be up to 50% longer. *Rolls are best enjoyed the same day, but will remain fresh covered tightly for up to 4 days in the refrigerator. I have been unable to use the print command. When I press print it goes to the correct screen but it immediately disappears. Make sure your browser allows pop-ups. From the new window, you can select to print the recipe in via your browser. If you still having issues, please contact our customer service and troubleshoot with you. 1-800-445-4746 (press 3 and then 6).